Contradictions are rife in the Christian bible. Here at The Skeptical Zone we have recently discussed those surrounding how Saul died. We’ve also noted the two conflicting accounts of Judas’ death and what he did with the thirty pieces of silver. There are dozens more. The creators of this site started with a cross-index of topics in the bible and pulled out those that contradict each other. You can click on the links to get more detail. As a bonus, the site includes references to the sections in the bible that contain Scientific Absurdities & Historical Inaccuracies, Cruelty & Violence, Misogyny, Violence & Discrimination Against Women, and Discrimination Against Homosexuals. Today marks the 11th anniversary of the conclusion of Tammy Kitzmiller v. Dover Area School District. This, of course, was the court case that made it clear that the Intelligent Design movement is nothing more nor less than yet another incarnation of creationism. The Dover trial had a number of memorable moments. Just months before, William Dembski posted his Vise Strategy at Uncommon Descent, talking tough about facing “Darwinists” in court. When he found out that his deposition would be attended by Wesley Elsberry and Jeff Shallit, Dembski suddenly found himself unable to participate. Another highlight was the NCSE’s discovery that the intelligent design creationist textbook at the center of the trial, Of Pandas and People, had been modified shortly after the Supreme Court ruled in Edwards v. Aguillard that the teaching of “creation science” is unconstitutional. Every instance of “creationism” and “creationist” had been replaced with “intelligent design” and “design proponent” respectively. Every instance but one, that is. “cdesign proponentsists” survived the edit to demonstrate that the terms are synonyms. Back in May of this year, Zack Kopplin reported that an Ohio school district was teaching creationism using a video from Harun Yahya. Yahya is the pseudonym of Adnan Oktar, an Islamic televangelist and creationist. Hemant Mehta, The Friendly Atheist, notes the that new CEO of the Youngstown school district is putting a stop to that. Starting immediately, science classes in the district will conform to state standards. Creationism, including the intelligent design variant, are definitely not part of those standards. It looks like a good start to the school year in Ohio. How Much For The Baptists? Matt upped the ante to $250. Still refused. He and his wife then started a GoFundMe page to see if they could raise $1000 for the charity. At the time of this post the total amount pledged is $12,670 and climbing. I encourage everyone to donate until we find out how much money it takes to convince a Baptist to do the right thing. The Christian Bible condones slavery explicitly in numerous passages. One of those reference often by slave owners in the Antebellum South comes from the story of Noah. The U.S. Court of Appeals for the 9th Circuit has ruled that it is a federal crime to visit a website after being told not to visit it. This decision is based on the Computer Fraud and Abuse Act. As the linked article notes, this ruling seems to somewhat conflict with a previous ruling by the en banc 9th Circuit, so there is a good chance that it will be appealed to the full court. In the meantime, though, it is conceivable that a sleazy lawyer could file federal charges against people who use pseudonyms to continue participating in an online forum where they have been previously banned for pointing out the ignorance and irrationality of certain protected members. It’s reassuring that we don’t know of anyone with the combined lack of self-control and ethics that would allow him to do such a thing. The Foundation for Thought and Ethics, the non-profit which once published the internationally controversial textbook Of Pandas and People, has quietly closed its doors. The financially-struggling organization was completely dissolved some time in early 2016, and its titles have been absorbed by the notorious Intelligent Design group, The Discovery Institute. More details and commentary on Pandas at the above link. Recent discussions of genetic algorithms here and Dave Thomas’ evisceration of Winston Ewert’s review of several genetic algorithms at The Panda’s Thumb prompted me to dust off my notes and ev implementation. In the spring of 1984, Thomas Schneider submitted his Ph.D thesis demonstrating that the information content of DNA binding sites closely approximates the information required to identify the sites in the genome. In the week between submitting his thesis and defending it, he wrote a software simulation to confirm that the behavior he observed in biological organisms could arise from a subset of known evolutionary mechanisms. Specifically, starting from a completely random population, he used only point mutations and simple fitness-based selection to create the next generation. The function of ev is to explain and model an observation about natural systems. I am an atheist. I do not believe that any gods exist. Being an atheist does not mean that I claim to have knowledge or proof that no gods exist. I have simply never encountered any objective, empirical evidence for the existence of any entity that fits the definition of “god”. If I were provided with such evidence, I would provisionally accept that at least one such entity exists. The word “atheist” has social stigma. 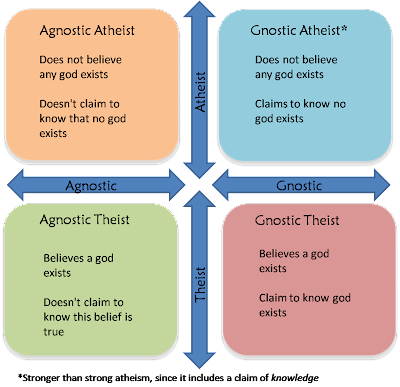 Some people characterize their lack of belief as agnosticism to avoid offending their family and friends. That doesn’t change the fact that if you lack belief in a god you are, by definition, an atheist. You might also be an agnostic, but that’s a separate issue. The only way to eliminate the stigma is to show the people we care about that belief in gods is not required to be a good spouse, parent, child, friend, or neighbor. I am an atheist. If you don’t believe in a god or gods, you are too. Thanks to Alan Fox for suggesting this topic.